C*4 presents "END OF DAYS" - Our final event at 260 McArthur Ave! Capital City Championship Combat Fan Community > C*4 Fan Community > C*4 Discussion (Moderators: Matt Fortune, RotchyKongISW, C*4) > C*4 presents "END OF DAYS" - Our final event at 260 McArthur Ave! Event is all ages – Adult Accompaniment ages under 16. Re: C*4 presents "END OF DAYS" - Our final event at 260 McArthur Ave! 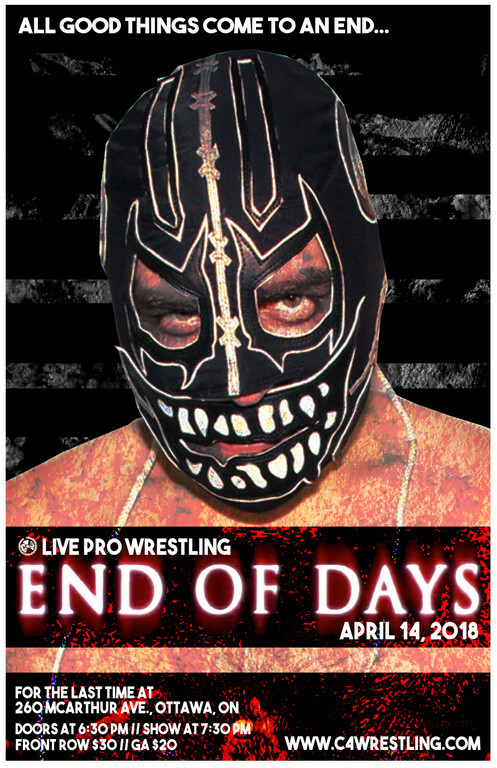 Our next show on April 14th, 2018 will be an event that a year ago, we would have never seen coming. Six months ago even, it was barely comprehensible. 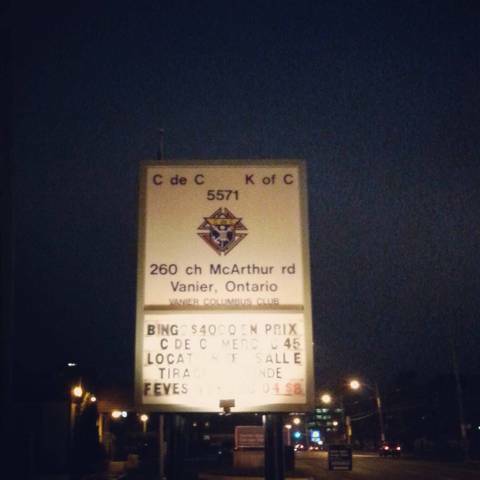 However, with a heavy heart we have been announce that on April 14th, we will bid farewell to our home for the last 10 and a half years, the Vanier Columbus Club, at 260 McArthur Ave.
A few things that we want to address with this news right away… Firstly this is NOT the last C*4 show. C*4 may be done at the VCC, however, C*4 is not done. In a lot of ways, we’re just getting started. We do have a new venue, which is very central, highly accessible, slightly larger, and I really think somewhere that we will grow and develop as just as much a home as 260 McArthur has been. However, we don’t want to focus on that at this moment. On April 14th, our future plans will be revealed (May 25th, 2018, FYI is the first show at the new venue). When we put out our survey several months ago, it was when we had heard rumblings of a sale. We used the results to help us figure out where we would go. We hope all of you join us on this ride, and look forward to the future with us. This was not a decision that we chose to make. The building will cease operations, and we will no longer be in a position to run shows there. If we were able to stay there, we would have. It simply would be impossible. We have long said, the only reason we would leave the VCC is if we could not continue to run. So, with that said, let’s focus on April 14th. 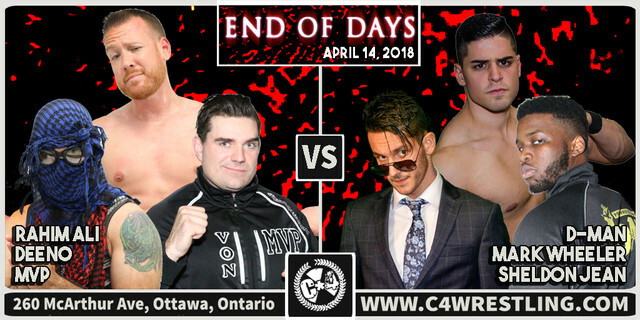 On April 14th, we urge all of you to be a part of history, and join us as we say goodbye to the building that put Ottawa’s independent professional wrestling scene on the map. If you have ever been to a show at 260 McArthur, we hope you will come out to celebrate this show. This will be an event that will not want to be missed. In the coming days and weeks, we will make many announcements regarding the huge card we have planned. In the meanwhile, do not fear the future – but look excitedly to what is to come. Celebrate the venue that witnessed countless stars passing through its doors… Kevin Owens, Sami Zayn, The Young Bucks, Luke Harper, Cesaro, Ultimo Dragon, Chavo Guerrero Jr, Paul London, Sara Del Rey, 2 Cold Scorpio, Roderick Strong, Eddie Edwards, Davey Richards, Kassius Ohno, Adam Cole, Kushida, Colt Cabana, Raven, Rhyno, Eddie Kingston, Dalton Castle, Tomasso Ciampa, Chuck Taylor, and many others. Celebrate the venue that gave birth, and witnessed star-making performances from the likes of “Speedball” Mike Bailey. Bask in the venue that month after month gave literally hundreds of talents a platform to perform for you and truly become a showcase for some of the very best in Canada, and the world. Celebrate the venue that hosted shows besides C*4, but also Chikara, Inter-Species Wrestling, and Femmes Fatales, and that hosted one of the only NWA World Championship defenses in the history of Ottawa. Be there to bid farewell to the building that was instrumental in building the independent wrestling scene in Ottawa to what it has become. And furthermore, perhaps a venue that has witnessed more history making moments and matches than any other in all of Ontario, and perhaps Canadian independent wrestling. Join C*4 in saying goodbye to an amazing venue and decade plus home. Lots of news to come starting later this week… In the meanwhile just plan on being there! Advance tickets are available NOW at the VENUE (Vanier Columbus Club, 260 McArthur Ave), and at VERTIGO RECORDS (193 Rideau Street, Ottawa)! General Admission available now at Otherside Tattoo (561 Gladstone Ave). A war has been brewing all season. On April 14th, that war will come to a head. On one side, a faction lead by a vindictive and dangerous madman. The other side, comprised of several of the most decorated stars in the history of C*4. On April 14th, the Last Battle of Vanier will go down. No DQ. No Count-out. One winning team. At this moment, we can state that despite the graphic, due to her suspension (http://c4wrestling.com/community/index.php?topic=1468.msg12146#msg12146) , Vanessa Kraven will not be allowed to compete alongside Mathieu St. Jacques, Thomas Dubois, and Stu Grayson. Will somebody else join them into battle? 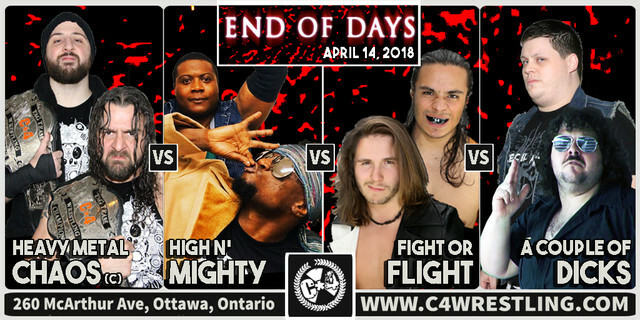 Whether it is four on four, or four on three, this will be the battle to end all battles to end our time at 260 McArthur Ave.
#C4EndOfDays – Exciting debut in a first time ever match-up! On March 17th, Matt Angel gave the performance of a career, and managed to score a win over David Starr, in a definite Match of the Year candidate. On April 14th, Angel will need to do everything he can to try and repeat history, as he’s got an equally large challenge ahead of him. Making his C*4 debut is the man who is perhaps best known for being one half of the Vaudvillans in NXT and WWE, the man formerly known as Simon Gotch, now better known as Simon Grimm. Since leaving the WWE, Grimm has been turning heads across the independent landscape with his superior grappling abilities. Angel will once again have to be at his absolute best, if he wants to stand a chance against the much more experienced and traveled Grimm. 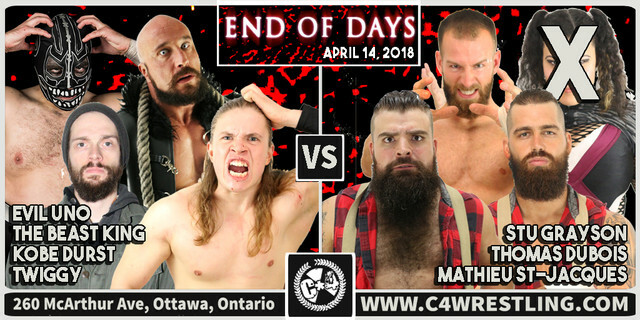 We’ve got another exciting match set for April 14th’s huge final event at the VCC, when we present #C4EndOfDays! Next up on the card we have a sure to be exciting three-way dance! Fresh from his tour of DDT in Japan for the last month, “All Ego” Ethan Page heads into action on April 14th. He looks to close out his time in the VCC with a big win… But he’s got two opponents looking to do the same thing. His first opponent, making his return to C*4 after a stint that had him teaching professional wrestling for most of 2017, in India, the high-flying and innovative, “Neon Ninja” Façade! Page and Façade have done battle previously in C*4 in singles competition, in a show-stealing contest. This time will likely be no different. The new addition to the battle will be a young man who is looking to score his first win in C*4 action. A man who has been turning heads lately wherever he goes – and did just that when he debuted going toe-to-toe with Stu Grayson. 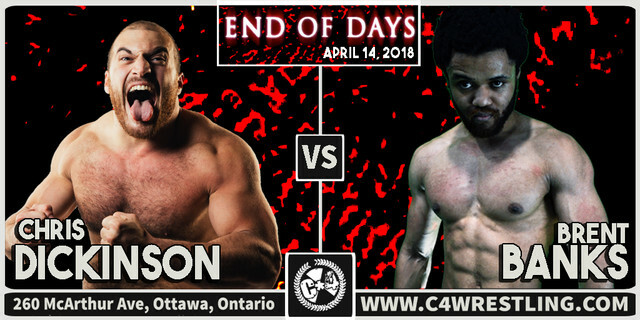 Returning to action on April 14th, is Josh Briggs! #C4EndOfDays – Tag Team Championship mayhem! 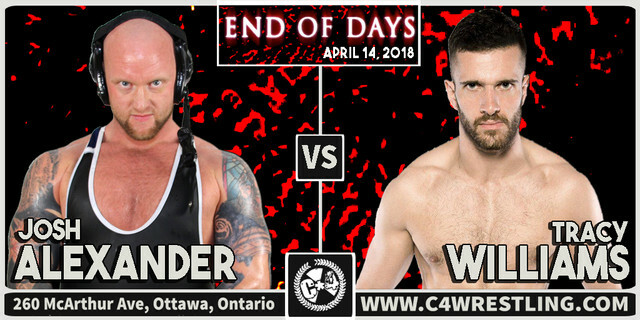 We’ve got a big Championship match set for #C4EndOfDays! #C4EndOfDays – Another possible show-stealer signed! With just over a week until our final event at 260 McArthur Ave, we are getting down to the wire, and still have lots to announce! Today, we are excited to reveal a big first time ever singles battle. After turning his luck around recently with a win against the debuting Teddy Hart, former C*4 Champion, “Walking Weapon” Josh Alexander is looking to continue his winning ways. His opponent, a man who has been turning heads for the last couple of years in EVOLVE, and Beyond Wrestling, as well as everywhere else he competes… Making his singles debut in C*4, “Hot Sauce” Tracy Williams! Do not miss this show, and absolutely don’t doubt this match will likely steal the show! #C4EndOfDays – Six Man Tag Team Action! Another day closer, and another match to announce for #C4EndOfDays! The rivalry that has developed between young Sheldon Jean and “MVP” Michael Von Payton will continue on April 6, 2018! Von Payton will team with long-time friends and allies Rahim Ali, and Deeno Benjamin. Will this trio be able to put a stop to Jean’s momentum? Teaming with Sheldon will be Mark Wheeler, another major standout over the last 12 months in C*4. And teaming with them, making his Ottawa return for the first time in almost two years, a young man who has been turning heads in Championship Wrestling from Hollywood, "D-Man" Daniel Parker! NO doubt about it, this will be an intense and fast-paced battle! #C4EndOfDays – This Saturday night! Another first time ever battle! Today, we’ve got another first time ever contest between two men who have impressed the C*4 audience at 260 McArthur time after time, over the years. Well, on Saturday night, they go head to head… And while we’ve said this several times already, this is yet another match that has the potential to steal the show! #C4EndOfDays – Sold out! Grudge Match! Card Change! First up, in an exciting bit of news for all of us here, we got word yesterday that #C4EndOfDays is an advanced Sell-out! At this point, we are hoping to have some tickets available the night of, but those will be in a strictly “Standby” type situation, and will be first come, first serve. We’re anxiously looking forward to this Saturday’s huge event. Right now, with that sell-out in mind, we’ve got another match to announce, and slight change to the card. Next, we’ve got a match featuring two men with unfinished business. 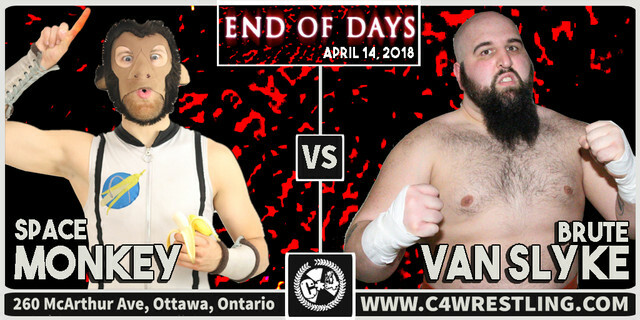 Last month, Brute Van Slyke suffered his first pin-fall loss in C*4, with Space Monkey leading the charge against him, during the C*4 Underground Gauntlet. With bad blood between them, they head into battle one more time… Will Space Monkey be able to repeat history, standing alone? Or will Brute continue to preach the gospel of Old School and overcome the monkey on his back? Lastly for today, we have some unfortunate news. Due to a scheduling conflict, the “Neon Ninja” Façade, will no longer be able to compete this Saturday. His replacement will be a man who first appeared in C*4 at 2017’s Underground event… Making his return – Tony Deppen!